U.S. President Donald Trump is likely to deliver a speech on Wednesday recognizing Jerusalem as Israel's capital, a senior U.S. official said on Friday, a move that could upend decades of American policy and further inflame tensions in the Middle East. Two administration officials said on Thursday that even as Trump was considering the controversial declaration, he was expected to again delay his campaign promise to move the U.S. Embassy to Jerusalem from Tel Aviv. The senior official and two other government sources said final decisions had not yet been made. The international community does not recognize Israel's claim on all of the city, home to sites holy to the Jewish, Muslim and Christian religions. A U.S. stance deviating from that of previous presidents, who have insisted that the matter must be decided in peace negotiations, would anger Palestinians, who want the city's eastern sector as the capital of their future state, and the broader Arab world. It could seriously undermine the U.S. administration's fledgling effort, led by Trump son-in-law and senior adviser Jared Kushner, to restart long-stalled Israeli-Palestinian peace talks. Nabil Abu Rdainah, spokesman for Palestinian President Mahmoud Abbas, said U.S. recognition of Jerusalem as Israel's capital would "destroy the peace process" and "destabilize the region." 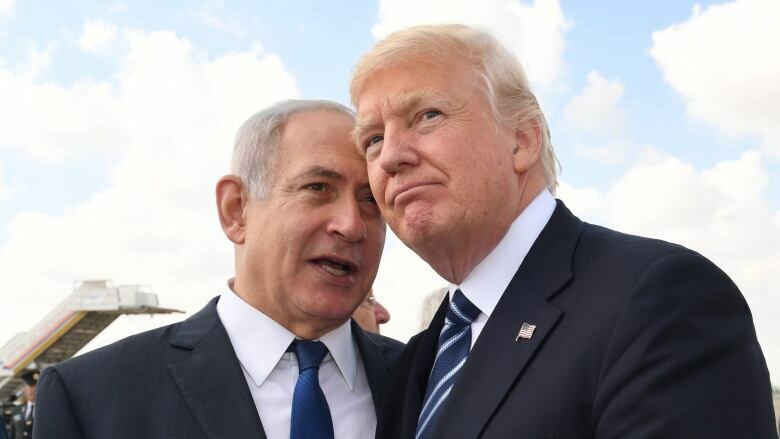 Such a move, however, could help satisfy the pro-Israel, right-wing base that helped Trump win the presidency and also please the Israeli government, a close U.S. ally. The senior official said on condition of anonymity that the decision was not final and could still change. Another U.S. official said Trump appeared to be heading toward recognizing Israel's claim to Jerusalem but that it was not a done deal. "We've nothing to announce," said a spokesperson with the White House National Security Council. After months of intense White House deliberations, Trump is seeking to strike a balance between domestic political demands and geopolitical pressures over the status of Jerusalem, one of the most sensitive core issues of the Israeli-Palestinian conflict. Trump is likely to continue his predecessors' policy of signing a six-month waiver overriding a 1995 law requiring that the U.S. Embassy be moved from Tel Aviv to Jerusalem, the officials said on Thursday. But among the options under consideration is for Trump to order his aides to develop a longer-term plan for the embassy's relocation to make clear his intent to do so eventually, the officials said. It was unclear, however, whether any public recognition by Trump of Israel's claim on Jerusalem would be formally enshrined in a presidential action or be more of a symbolic statement. Trump pledged on the presidential campaign trail last year that he would move the embassy from Tel Aviv to Jerusalem. But in June, Trump waived the requirement, saying he wanted to "maximize the chances" for a new U.S.-led push for what he has called the "ultimate deal" of Israeli-Palestinian peace. Those efforts have made little, if any, progress so far and many experts are skeptical of the prospects for success. The status of Jerusalem is one of the major stumbling blocks in achieving peace between Israel and the Palestinians. Israel captured Arab East Jerusalem during the 1967 Six Day War and later annexed it, a move not recognized internationally. Arab governments and Western allies have long urged Trump not to proceed with the embassy relocation, which would reverse long-standing U.S. policy by granting de facto U.S. recognition of Israel's claim to all of Jerusalem as its capital. Visiting Washington this week, Jordan's King Abdullah warned lawmakers that moving the U.S. embassy could be "exploited by terrorists to stoke anger, frustration and desperation," according to the Jordanian state news agency Petra. Some of Trump's top aides have privately pushed for him to keep his campaign promise to satisfy a range of supporters, including evangelical Christians, while others have cautioned about the potential damage to U.S. relations with Muslim countries.